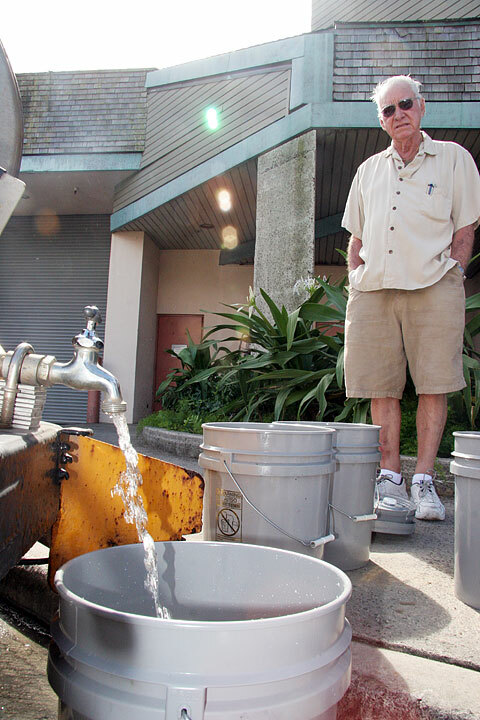 About 60 tenants at the Hawaii Kai Shopping Center and 229 families from an adjacent condominium building were without water for nearly a day because a corroding water line on Keahole Street main broke twice. Water service was restored by 4:45 p.m. yesterday, said Cary Shinozawa, Honolulu Board of Water Supply site supervisor, "but we'll all be crossing our fingers" that the 12-inch pipeline holds. The 34-year-old water main first gave way at 8:45 p.m. Wednesday, underwent repair but burst again at another point 10 feet away at 4:30 a.m. when crews filled it with water, he said. Shinozawa said the pipeline could break again at any time because it is corroding due to seepage from ocean water and because of its age. The same line, which runs from Kalanianaole Highway into the valley up to Hawaii Kai Road, broke in January near the Tesoro gas station, but for a shorter period. Businesses hauled buckets of water from the nearby marina, and residents took water from their swimming pools to fill their toilet tanks yesterday. Bob Liu, a resident of the 229-unit Kalele Kai condominium, said he made two trips down to the swimming pool to fill buckets so he and wife Judy could flush their toilet. Judy Liu said she and other residents filled their stock pots from water tanks supplied by the Board of Water Supply for brushing teeth and washing dishes. Only two businesses closed, but most of them limited service due to the water problem, said Carl Johnsen, shopping center general manager. Portable toilets arrived by 11 a.m. yesterday, and two water tankers were provided at the shopping center and one at the condominium building. One tanker was designated to keep Safeway supermarket's refrigerators operable, he said. BluWater manager Deb Costello said she decided to close her restaurant because there was no sterile water for washing dishes or cooking. "I would rather lose sales than have someone get sick. ... Today would've been an enormous day. I turned away about 50 customers by 12 (noon)," Costello said. Brendan Burchsiel, general manager of the Shack restaurant, said he had to close three hours earlier than usual Wednesday night, at about 10:30 p.m., losing about $2,000, but opened at 11 a.m. yesterday.